It’s Kay-El, Not Kal-El | What an Amazing World! At the end of this year, I decided to go on a solo travel abroad, which is a new experience to me. I chose Kuala Lumpur in Malaysia as the place where my first trip as a solo traveler begins. Not because I am very much interested in the city, it’s just because it is close to Jakarta (I should try from an easy one before I travel to more challenging places, right?). Thanks to Air Asia, flying abroad has never been cheaper, and also thanks to the abolishment of tax for traveling abroad, it does save quite a lot of money. It took 2 hours flight from Jakarta to KL (this is how people like to call the city). Once I arrived at the Kuala Lumpur’s Low Cost Carrier Terminal (LCCT), I took a bus which goes to KL Sentral (this is the hub for almost all means of transportation in KL) for about one hour. From KL Sentral I took Light Rail Transit (LRT) to Pasar Seni Station, the closest LRT to the hostel where I stayed, that is The Travel Hub. It’s not difficult at all to find the hostel. I just followed the direction which was given in the confirmation email as soon as I made the reservation through HostelBookers. The signboard is not that big though, but if you read carefully then you’ll find the hostel. I was welcome by the owner, a very nice Sri Lankan lady, who runs the hostel with her two daughters (Kuku and Anu) and a boy (I forget his name). I had a very pleasant impression about the family and the hostel itself, well, other than the dorm which is really packed (what can I expect for such a low price anyway?). However, overall the hostel is nice and cozy, the bathrooms are fairly clean, and the daughters are just the nicest persons since they will certainly help you with anything (from information about directions, transportation, and even free soap!). After putting my bag in the hostel, I went around Chinatown (the larger area around the hostel is actually KL’s Chinatown). I walked in the middle of burning sun (it was very hot that day) and found a very beautiful Hindu temple just 5 minutes away from the hostel. 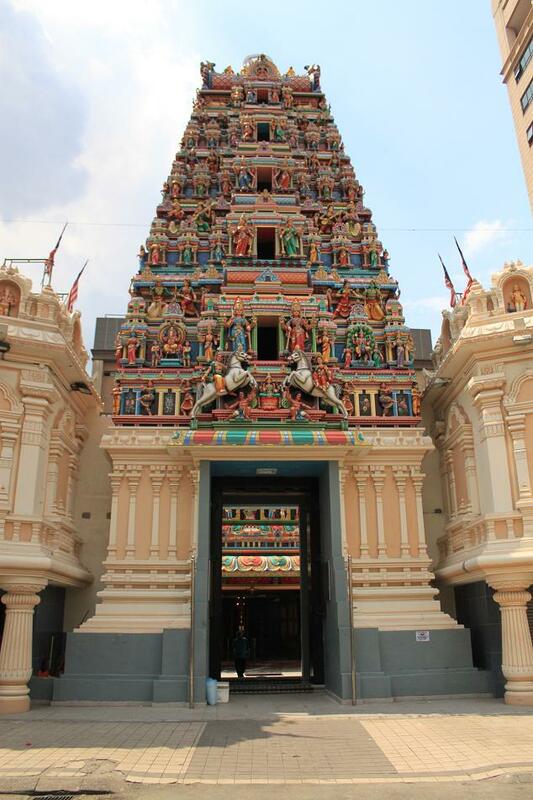 The place is called Sri Mahamariamman Temple, one of the most important Hindu temples in KL. The gate is decorated with colorful statues of Hindu deities. 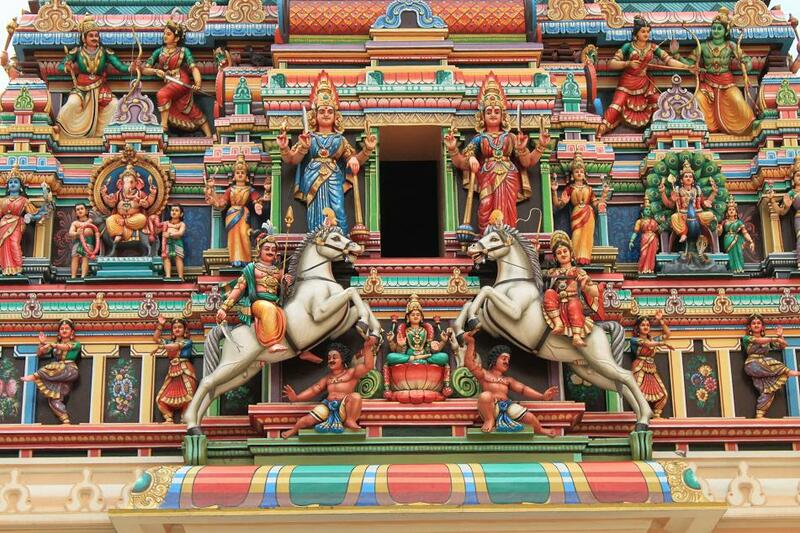 Each statue was meticulously carved and colored so that it looks so smooth and amazingly beautiful. 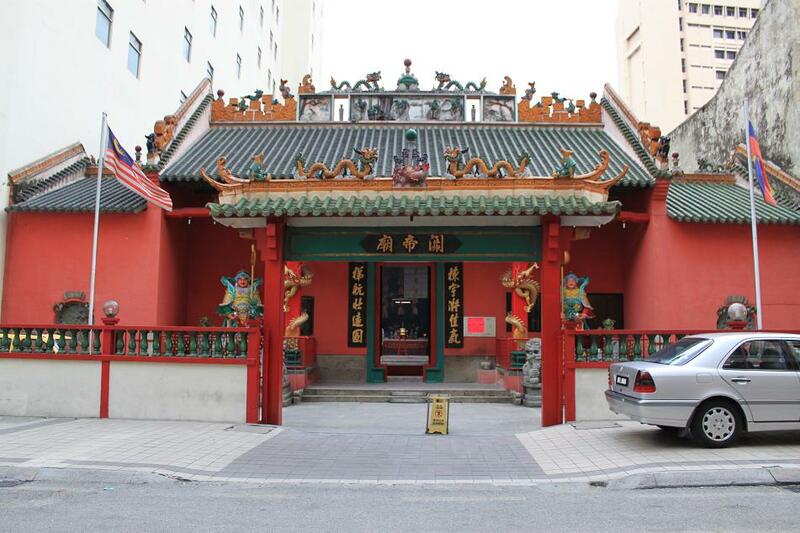 A few meters away, I found a Taoist temple, which is also interesting although the design and decorations are not so complex as Sri Mahamariamman’s. 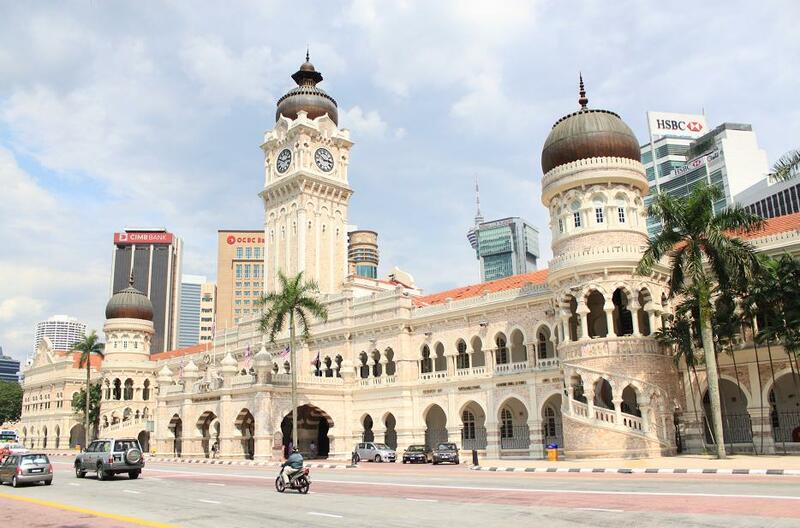 A few minutes walk from both temples I found myself standing in the middle of Dataran Merdeka (Independence Square) where I can see a beautiful building with strong middle-eastern influence on its architecture (Sultan Abdul Samad building) across the square. I didn’t stay too long at the square since the heat was torturing me. 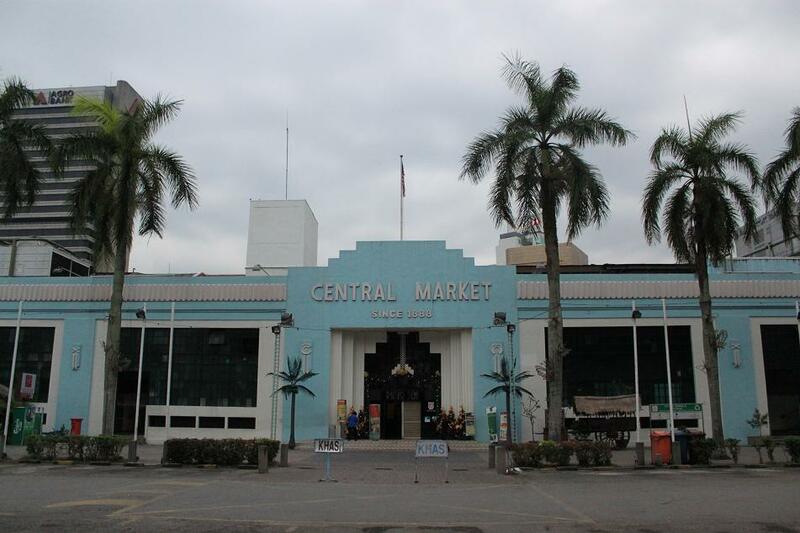 I headed straight to Masjid Jamek area which is an area where you can find a lot of food stalls. After having late lunch around Masjid Jamek, I went to Kuala Lumpur City Centre (KLCC) to see Petronas twin towers. I went there by LRT again and paid for a single trip fare. As soon as I got off KLCC station, I was thinking of buying a 3 days or so public transportation pass. In other countries this kind of pass usually save quite a lot of money for tourists who travel heavily from one place to another. So, there I asked for a 3-day pass, and it turns out that they have a Touch ‘N Go card which can be used for almost all of KL’s transportation providers (KL has different transportation providers, such as KTM for commuter train and RapidKL for LRT). It was not until my last day in KL that I found out about this very beneficial feature though (you will know why later in this post). 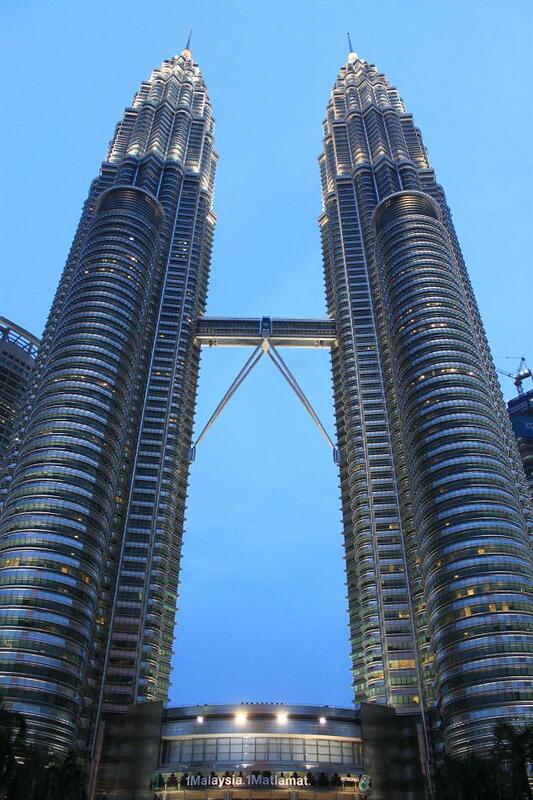 Petronas twin towers are truly a maginificent work of art and engineering. Eventhough I have seen the picture of the twins in media, seeing it directly with my own eyes was the real thing. When I got there, the park where people usually take photographs of the towers was still relatively empty. The fountains were also had not been operated. I decided to stay there until I got the pictures of the towers flooded by the light which makes it stand out among other buildings in the city (well, without having so much light they have virtually stand out among the buildings crowd, but the light adds up the dramatic effect to the towers). While waiting for the day gets dark, I was frequently asked by some tourists to take their photographs with the towers as the background. Some Chinese, Japanese and Indian tourists asked me with their local languages, while they didn’t seem to understand English. So, the communication was made by the simplest way ever, smile. Smiles do make life easier, including asking a stranger to take a photograph of you. After taking enough photos, I went to Bukit Bintang which is accessible from KLCC by LRT (go to Kelana Jaya direction and get off at Dang Wangi station. 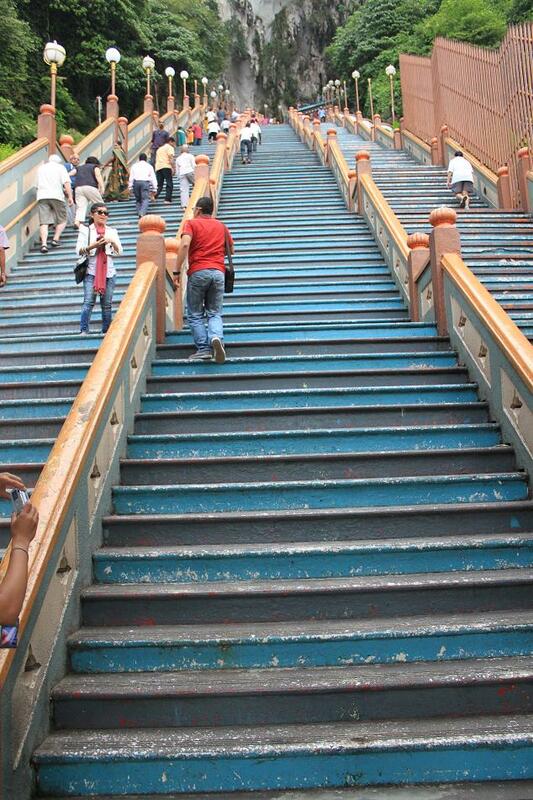 Take a little walk to Bukit Nanas monorail station. You can see KL Tower around this area. 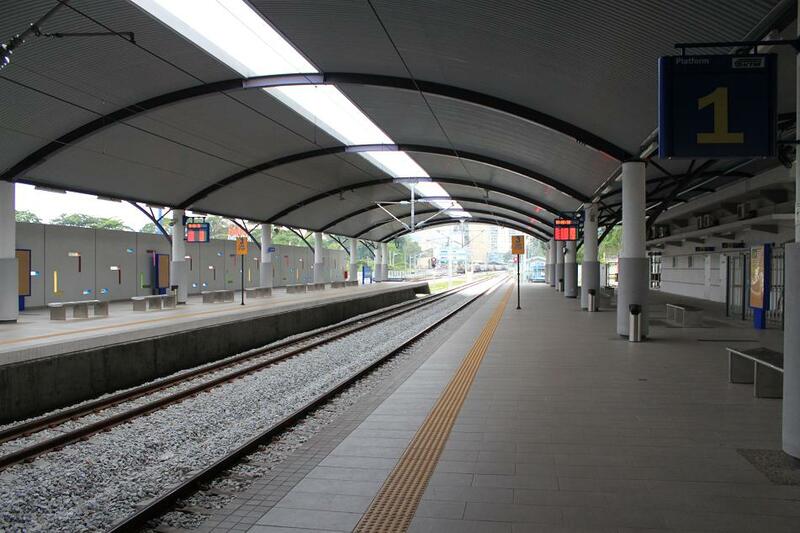 From Bukit Nanas, take the monorail bound for KL Sentral and get off at Bukit Bintang station). 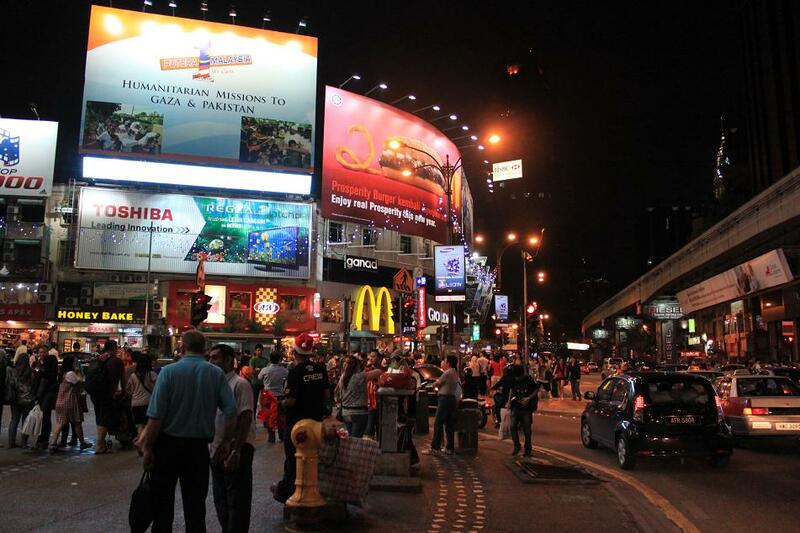 Bukit Bintang is a place which resembles Piccadilly Circus in London, with all the light, billboards, stores, malls, and lots of people! It was Christmas eve when I went there, so the area was heavily congested and packed with so many people (too many I think). After walking around, I searched for a place to have dinner. Then I found Jalan Alor which turns out as the traditional food center (night hawker style) of Bukit Bintang. I had Kway Teow Pattaya (which is wide traditional Chinese noodle covered with omelet) and Teh Tarik (traditional Indian-Malay tea). I don’t know whether the food and drink were nice or simply beacuse I was so hungry, but they all tasted so delicious. At around 9 pm I went back to the hostel to have some rest. At the hostel I wanted to use the internet for checking emails, however since there’s only one computer available so I had to wait for someone else who used the computer before me (this is one negative thing about the hostel. I think they should have more computers for the guests). While waiting, a Dutch guy talked to me and asked me about things in KL, which I couldn’t say much for my first day. Late that night I went to sleep in the dorm. I couldn’t sleep well since I heard sounds and voices over and over again from guests who came very late or even those who just checked-in that late. They tried to be as discreet as possible actually, but probably since I was not accustomed to it then I had a rather unpleasant sleep during my first night there. But the great thing is both sisters are always there to help you, 24-hour! The next day I woke up very early because I had so many plans. I took a walk around Central Market, which was still closed, and looked for something to eat (actually at the hostel they provide free breakfast, but since I got out so early everyone’s barely still asleep). I stopped by an Indian/Pakistani restaurant then decided to go inside. I asked for the shopkeeper for any interesting food and he gave me two kinds of bread (one is called Wadai while I forget the other’s name). The breads are served with two kinds of curry, ‘normal’ curry and very spicy one. After paying for the food I went to Lebuh Pudu which is still around Chinatown. This is the place where buses stop to get passengers. I intended to go to Batu Caves and from what I read on Lonely Planet, we can go there by taking bus no.11 from Lebuh Pudu. Actually it took me several minutes to learn how to get on the bus because I was spotting the wrong buses for about half an hour. Suddenly I saw no.11 on a bus which was stationed nearby. I instantly went to the bus and it is indeed the bus to Batu Caves. I waited for about 15 minutes for the bus to depart. During my way to Batu Caves I was actually a bit terrified by the way the driver drove the bus. He was like totally loco! After about 45 minutes I finally arrived at Batu Caves. This is one of KL’s tourism hostspots, for a really good reason. The place is basically a hill with caves inside of it. What makes this place so special is because this is also a holy place for Hindus. Every year they celebrate Thaipusam, a Hindu festivity celebrated mostly by Tamil descendants. 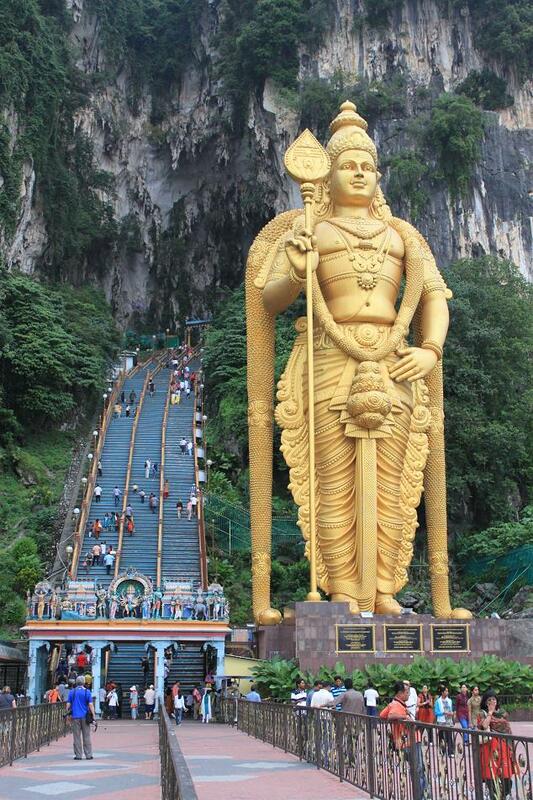 A 42.7 meters tall Murugan (the principal deity of the temple) statue sits in front of the stairway to the caves, which is also the tallest Murugan statue in the world. But other than Murugan, other deities also have their own designated temples, such as Hanuman/Hanoman, Ganesh/Ganesha and others. Climbing the staircases is no easy thing to do. Even the healthiest person will find it challenging to climb. But no need to worry, even older people manage to reach the top. From the top we can see the land below through Murugan’s shadow. 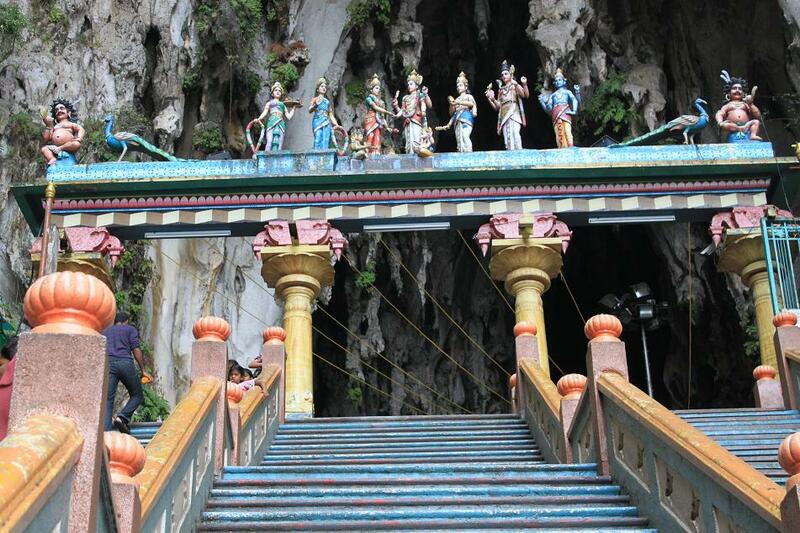 Then I entered the caves through another beautifully decorated gate depicting Hindu deities (the other gates are at the entrance of the Batu Caves area and at the beginning of the climb). Inside the cave the view is astonishing. It was more than a cave since it has a Hindu prayer hall and so many deities statues carved on the cave’s wall. Walking through the cave for about 100 meters, we will find another staircases (not many) which lead to a huge opening (like Pantheon’s hole) where another prayer hall is located and so many monkeys wander around. I suggest you keep a distance to the monkeys though. After having submerged into this place’s mystical atmosphere, I went back through the same staircases (the way down is no easier than the way up). 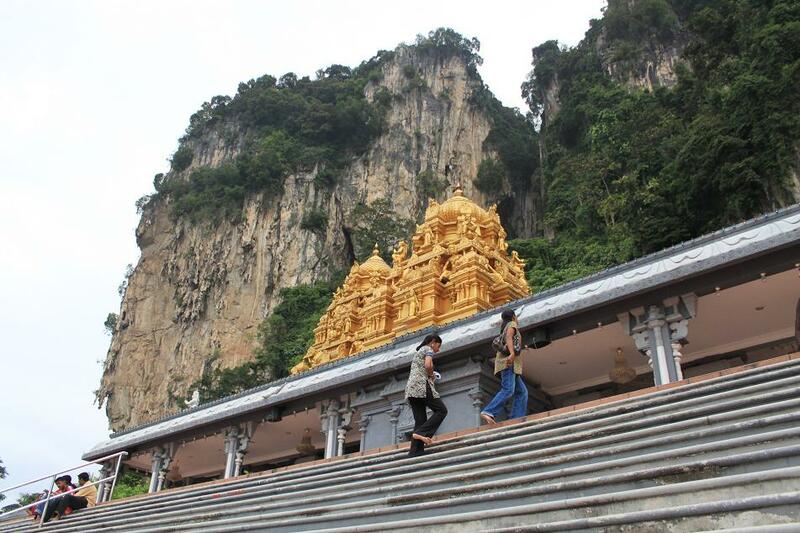 After completing my last step, I walked to a least crowded area, still in the Batu Caves complex. There is a temple which has two gilded decorations on the top of it, and there’s also a Hanuman temple nearby (which has tall Hanuman statue on the top of it). When the sun got higher, I decided to leave Batu Caves to go to Brickfields area (not far from KL sentral) to see Thean Hou temple. Before I left Batu Caves, I happened to see a glimpse of a new building with ‘Batu Caves’ letters on it, therefore I supposed that it is a train station. The information which I got earlier says that there is no train or LRT line to Batu Caves, however I went to the new building anyway just to check things out. When I got there, the place is as silent as a cemetery. Only a few dogs there and a small family waiting for someone to pick them up. Filled with doubt, I ascended to the ticket counter and apparently the ticket machine is in operation. I checked the line and found KL Sentral on the list, hence I bought a ticket to get there. Later I learned that Batu Caves is part of the recently-extended Sepang-Port Klang line. 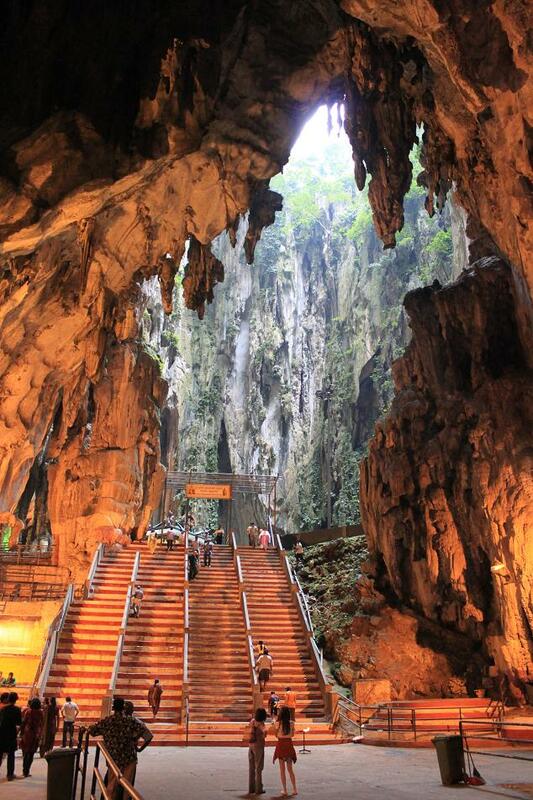 This is a good thing because Batu Caves is a very interesting place to visit. Therefore by providing a train line to Batu Caves, more and more tourists will definitely come there. After arriving at KL Sentral, I went to Brickfields which is basically the district where KL Sentral is located. 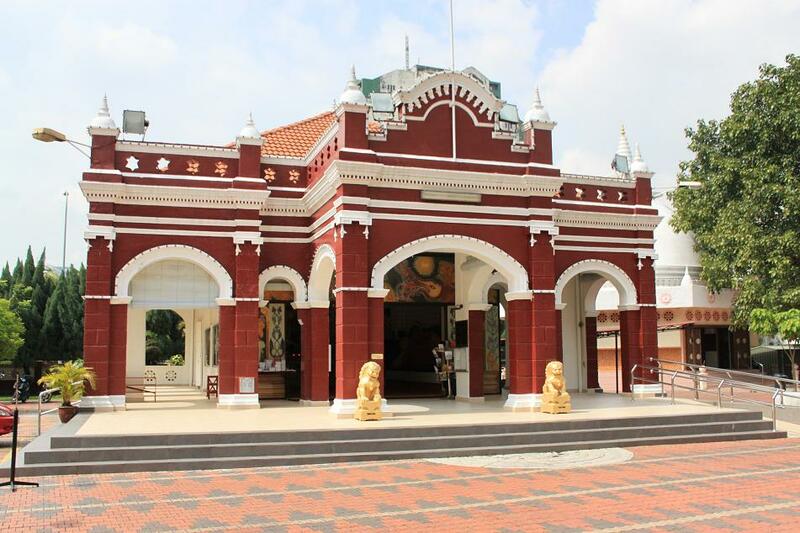 I was looking for a temple called Thean Hou temple which some references say that it is a huge temple. I did a little research and noted Brickfields as the location where the temple sits. After walking for about 30 minutes under clear-day burning sun, I only found a small temple called Buddhist Maha Vihara. Not quite what I expected actually, and definitely it is not Thean Hou temple. There was no one around so I couldn’t ask for any direction. 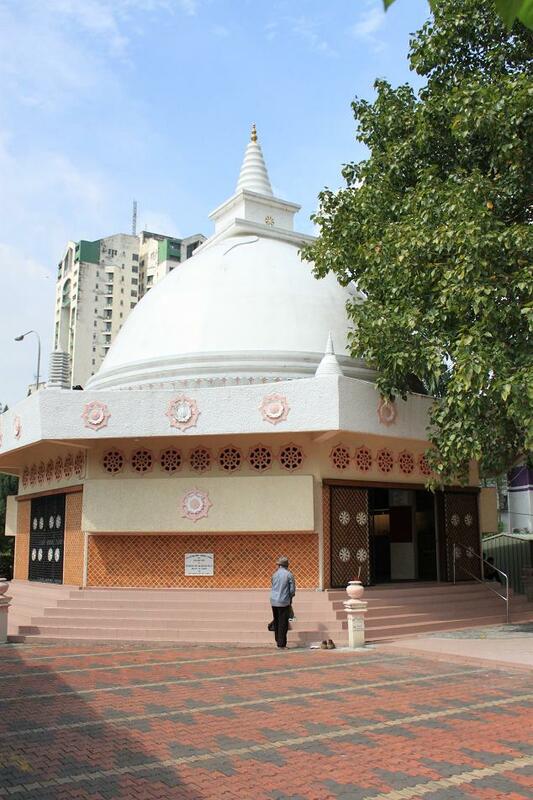 However, having walked to that place, then I thought that I shouldn’t miss to take some photographs of the vihara, although there’s nothing special about it (except the white dome which resembles those in Sri Lanka). I went back to KL Sentral to go to Putrajaya, the new capital area where government’s offices are located (including the Prime Minister’s office). Putrajaya is halfway between Kuala Lumpur International Airport (KLIA) and KL Sentral. It can only be reached by bus, private car, or KLIA Transit ( a high-speed train serving KLIA, KL Sentral and several stations between them). After checking for the price which I think is quite reasonable, I decided to take the KLIA Transit. Basically the trains they use have the same specifications as those used for KLIA Ekspres (a non-stop high-speed train service between KLIA and KL Sentral). These trains can reach top speed of 160 km/h for daily operation. Getting onboard the train gave me a different sensation because I can feel it when the train accelerates to its maximun speed only in short time. Before coming to Putrajaya, I looked for information about how to go around Putrajaya, and some references say that taxi is the best choice which can be chartered for RM 50/hour. After arriving at Putrajaya station I went directly to the information center and asked for a map and some directions. The staff told me to go around by bus only for 50 cents (one way). This is so much cheaper than taxi of course, hence I decided to hop on a bus (if you wish to go around Putrajaya’s main tourism attraction, which is around Perdana Putra building, take bus no.100, 101 or 300 provided by Nadi Putra bus company, and tell the driver that you want to get off at JPM). 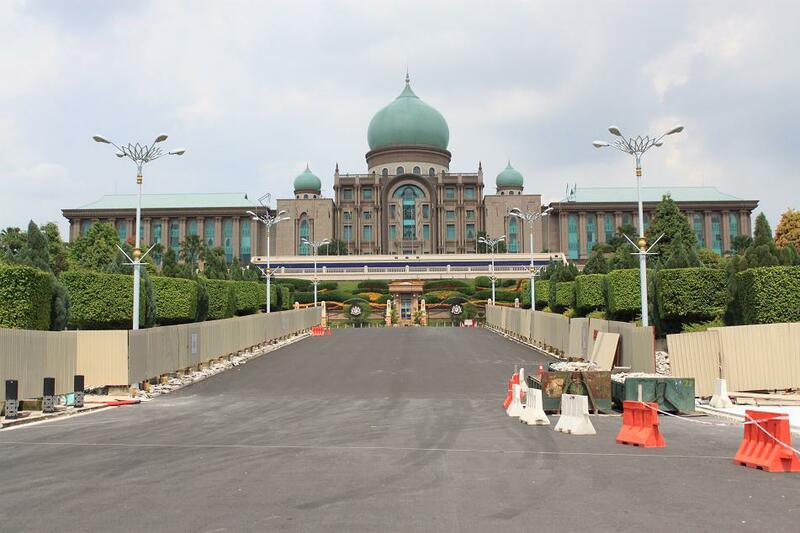 Once I arrived at JPM, I could see Perdana Putra’s (Prime Minister’s office) rear side. It is located up in the hill, therefore it looks so grandeur up there, let alone the building’s massive structure. After walking several meters circling the perimeter, then the façade of the building can be clearly seen. 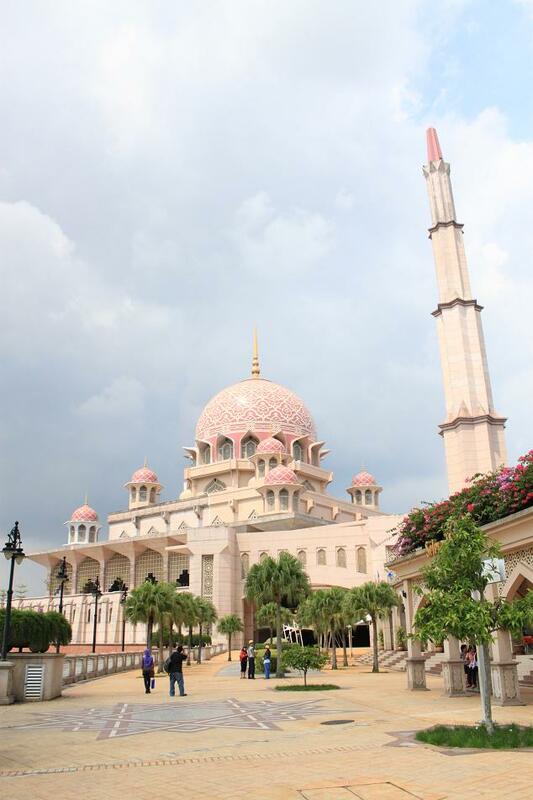 A few meters away, we can find Perdana mosque, which serves as the main mosque of Putrajaya. Behind the mosque there’s an area where we can find many restaurants while sitting and enjoying the beautiful view of the river behind the mosque. 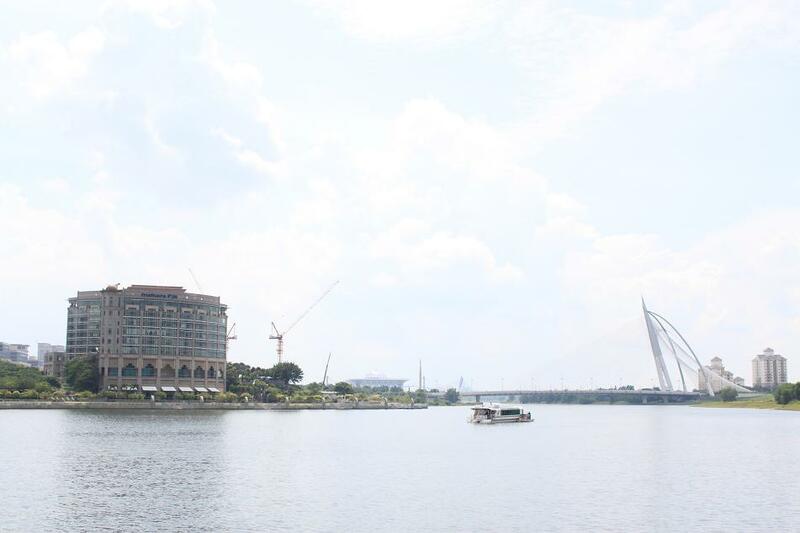 At the other side of the river we can see Putrajaya’s other great offices and also iconic Seri Wawasan bridge. I believe at night the view of this area is much more beautiful. After taking some photographs, I had a very late lunch at an Indian restaurant and ordered Nasi Briyani (Briyani Rice). Again, the food was so delicious (I was extremely starving at that time). A few minutes later, I went back to Putrajaya Sentral station to go to KL Sentral again. To wrap up the day I decided to go to Bukit Bintang again and did a little shopping (just a little, since my bag is not a big one). That afternoon I just realized that my Touch ‘N Go card can also be used for monorails. At around 8 pm I went back to the hostel and decided to sleep early because I had been so tired. On the third day, I had not decided where to go in the morning before going to the airport again to go back to Jakarta. 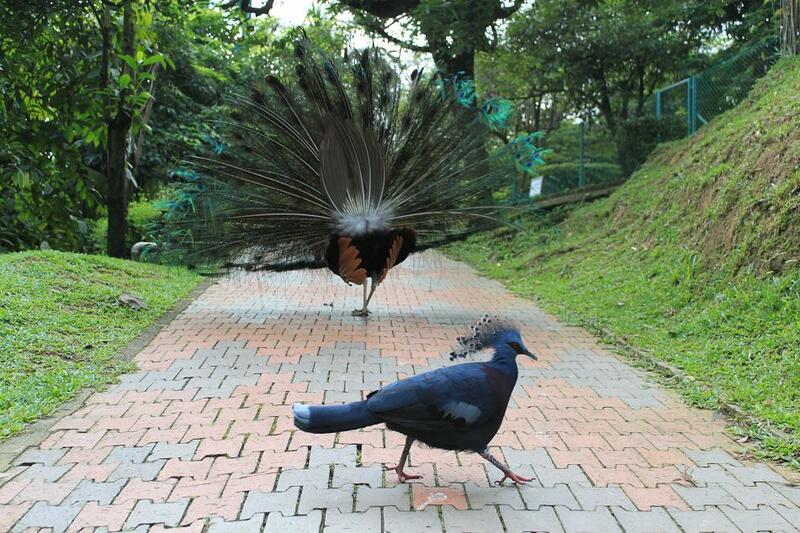 I was looking for some brochures and information on the internet and found this place caled KL Bird Park. It claims itself as the world’s largest free-flight walk-in aviary, which means that birds wander outside cages and we can interact directly with them. 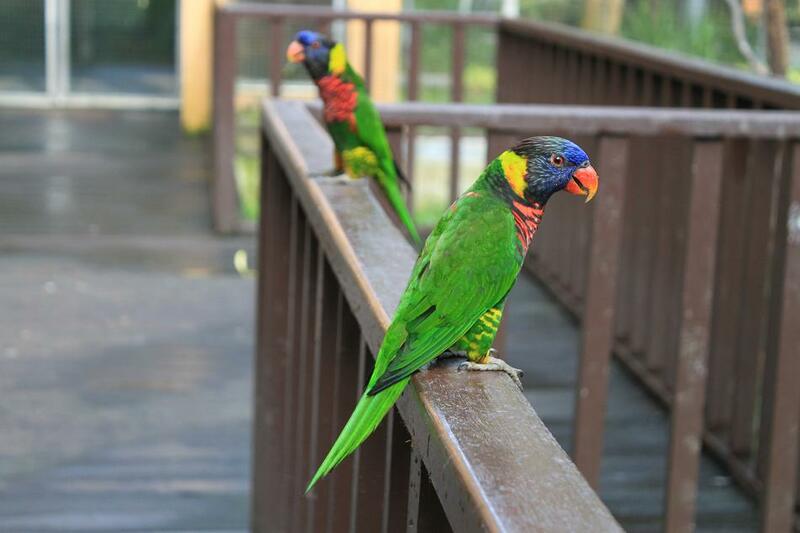 The bird park is accessible within 20 minutes walk from Pasar Seni LRT station. 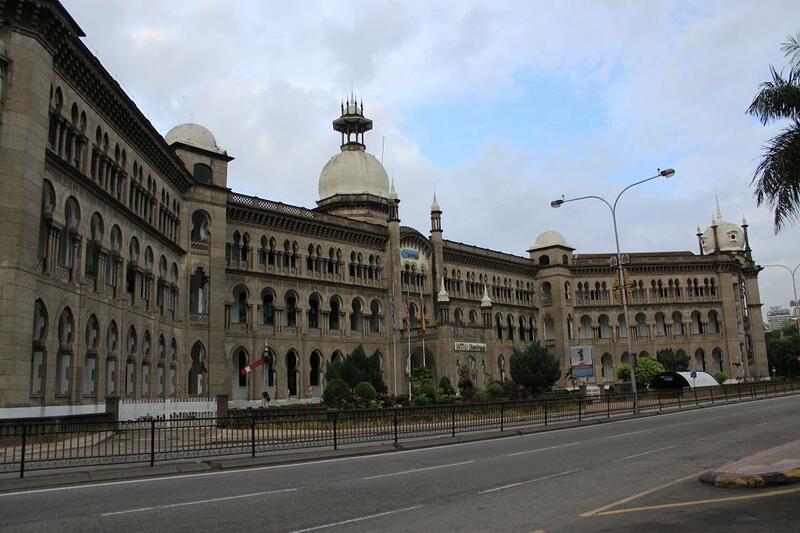 Along the way I walked pass KL’s old railway station and KTM’s (Malaysia’s state-owned railway company) headquarters. Both buildings are lavishly decorated with Moorish-style ornaments. After taking some photographs, I continued walking to the bird park, which turns out to be up in the hill. Therefore the way up there was a bit tough if you are not in a good shape. Before reaching the bird park, I met a quite large family of monkeys traveling from one trees to another right above my head. I was one of the first visitors of the bird park that day. As soon as the gate is open I instantly got into the aviary. Near the entrance, I met a lot of love birds. Some of them were eating and some were just doing nothing. From there I proceeded to the next zone and met peacocks, cranes and some other birds walking and flying around the visitors. The other zones of the bird park are parrot zone (where parrots and macaws flew around here and there inches away from your head! ), flamingo zone, non-flying bird zone (where we can see three of the world’s largest birds, i.e. Ostrich, Emu and Cassowary), hornbill zone, owl zone, etc. At around 10.30 am I wrapped up my visit to KL Bird Park and went to KL railway station to go to KL Sentral. At the old station I just found out that I can also use the Touch ‘N Go card (if only I had known this much earlier). From KL Sentral I went to the airport by an airport couch and got to the airport an hour later. I came to the airport way too soon actually, 2-hour too soon. So, to kill my time, I just wandered around the airport and learned things. 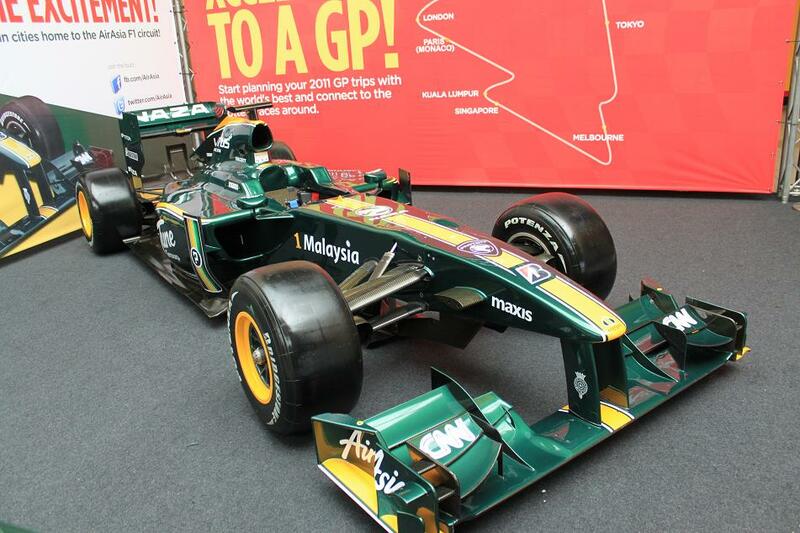 I also found a prototype of a new F1 Grand Prix team vehicle. The team bears the name and sponsors mainly form Malaysia, such as Air Asia, Tune Group, Proton, and 1Malaysia. I think Malaysians are really eager to show the world that they are one pride nation and they do have good reasons to be proud of. I guess that wraps up this KL solo traveling of mine. KL is a big city which has quite a lot of things to offer. However, this ever-developing city still faces the same problems like in other big cities in developing countries. The transportation system is not as advanced as Singapore’s, but obviously much better than Jakarta’s. Well, KL is not a super city that can overcome all of its problems in one night. It is not Kal-El (Superman’s original name) who can cope with every obstacle. But it is Kay-El, with all the good and bad things of it. This is just the beginning of my solo travel. Bye for now. first thing first, I’m happy to be such an inspiration to you..you know, doing the solo backpacking thing…hahahha…but at the same time..i’m ashamed of myself..i have visited KL over 10 times but still didn’t manage to visit batu caves..and thx for the info for the new railway line…it would be easier for me next time I visit KL, i will try to go there,hopefully..it seems the travel bible (read;LP) really come into handy ya.on top of those,after reading this post i feel really like writing but i’m experiencing absent minded at this very moment..writer’s block…#gayaloja..ja…hahahha..
Man, since you like everything about India then Batu Caves is definitely a place to go if you got a chance to visit KL again. Kerennnyaaaa Bam.. Jadi pengen.. Tapi doh, masih hektik segala macem nih boro-boro travelling.. Hehe..
Hmmm, I knew someone would comment about the soap, I just never expected that is you, hahaha… Hey, come on! I didn’t bring any soap, then I asked her where I can buy a soap, and she just gave me free soap bar! Sok mangga atuh neng…let’s travel!!! Solo trip to Thailand sounds great!!! you should go!!! Dude that was a longgggggg blog I haven´t managed to read it all though. I will read it all but I need to go to supermarket now before it shut. Anyway, I am glad that you managed to travel to great places and after seeing your pictures – oh it´s awesome! I am really happy for you. I will put another comment once I read all your blog. By the way London-Belgium-and specially Germany are covered with snow. It’s pretty BUT hard to drive 🙂 Today in Nurnberg is minus 16 and I believe tonight it will be minus 20 ya ya it’s damn cold – colder than my freezer. In the mean time Happy New Year to you and your family. All the best for 2011 and best wishes from me and sudip. Please send my best regards to Mas Win and his family..
btw, where is the hostel picture? hehehehe..
well well well, are you going there? Well, apparently one day in Kay-El is not enough. It does resemble Jakarta in some ways, only it has better mass transportation system. Hmmm, I didn’t notice whether my ‘plegkiness’ came out, only one thing for sure: since I was traveling alone then I have to pay attention to everything and every sign..
Pingback: Batu Caves and The Calling to Go to India « What an Amazing World! Pingback: My 7 Links – A Quick Look to My Old Posts « What an Amazing World! That’s a very well written and informative piece. Came in very handy in planning my solo trip to KL in December. I came across this really interesting platform to connect with co-travelers http://www.mingletrips.com/ Just connected with some really cool and exciting people to check out KL with..! Pingback: Just Passing Through, Kuala Lumpur « What an Amazing World! Great Post! Indeed a very useful post. I’m visiting KL on Solo trip (for the first time ever)! Looking forward to all these things KL has to offer. I’m glad this post helps you to better plan your visit to KL. My favorite place in the city was Batu Caves, but one thing you can’t go wrong with KL is its street food scene. 🙂 Wish you a very great time in KL! Pingback: Behind the Scenes at What an Amazing World! | What an Amazing World! great post. I’m currently staying in KL. a good choice to start your travels. hope you liked it. KL is well-connected to many parts of the world, so yea, it’s a good place to start or a convenient place to transit during your travels.